It may be warm outside but in offices up and down the country, women are frozen stiff…while men enjoy the air-con. Look around any open plan office and you will see women working with jumpers wrapped round their legs or wearing coats to keep warm. That’s without mentioning the emergency office jumper or cardigan. Welcome to the modern office – where women endure the air-con, and men have no idea there is anything wrong. But there is something wrong – and it’s a sexist wrong. Men work in comfort, while women shiver. 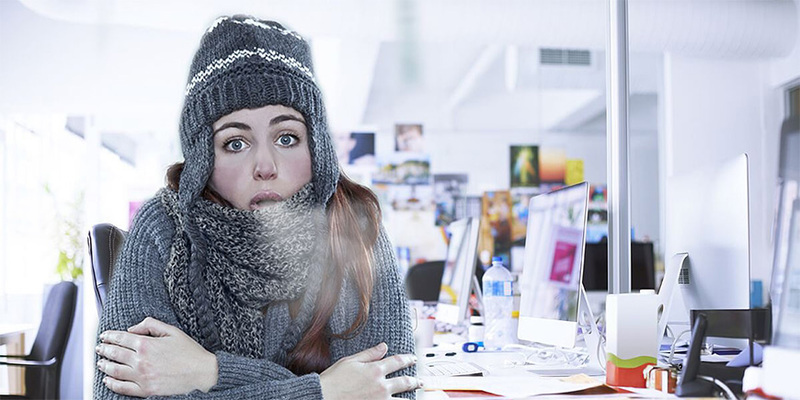 Most air-con systems are designed for a ‘typical’ office worker’s body temperature and metabolism. Sadly, that ‘typical’ office worker just happens to have the body of an 11 stone, 40 year-old man, which runs up to 30 per cent faster than a woman’s. If you don’t have the body of an 11 stone, 40 year old man, you’ll likely freeze. So, while men are comfortable, the majority of women need conditions to be nearly three degrees warmer. Which explains why so many feel so cold. They make up the difference with extra jumpers and cardigans in summer just to keep warm. Men typically have more heat generating muscle than women and so feel comfortable at cooler temperatures. But in case you’re still doubting air-con systems are sexist, there’s more. In 1998, researchers at the University of Utah found that despite women having higher core temperatures than men, their hands were consistently colder. While men registered an average hand temperature of 32.2 °C, the temperature for women was just 30.6 °C. It might sound like it isn’t that big of a deal, but when you sit at your desk freezing every day, with numb fingers trying to type out thousands of words, it can be incredibly frustrating. So, women have a choice to either sweat during your commute and lunch break because you’ve got your winter gear on, or wear normal clothes and shiver all day. It isn’t just fashion that suffers. Cold temperatures can lead to physical problems – hunching over more and a build-up of tension too. The colder you are the thicker your blood, there’s an increase blood pressure and a tightening of the airways. And cold staff are more likely to make more mistakes. In a 2004 study, typing errors nearly halved when the office temperature went up from 20 to 25 °C and output increased a whopping 150 per cent. If that’s not an incentive for employers to sort out the air-con problem once and for all, we don’t know what is.